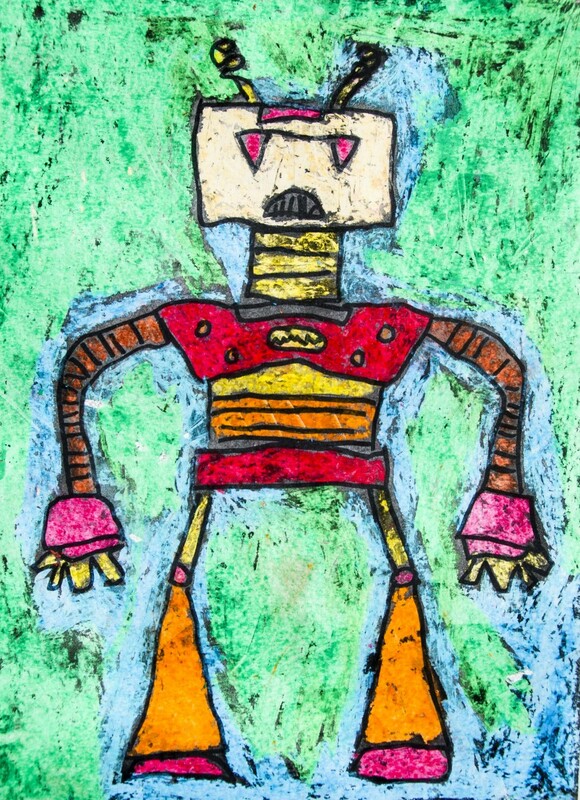 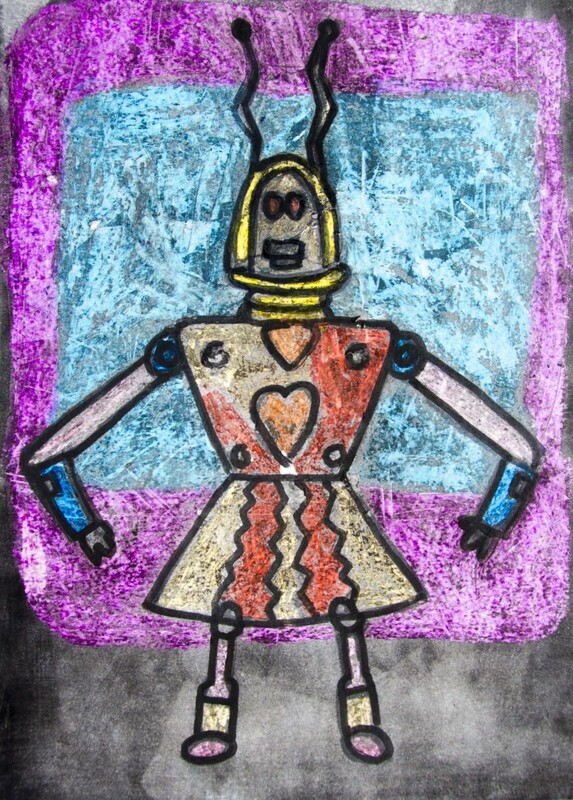 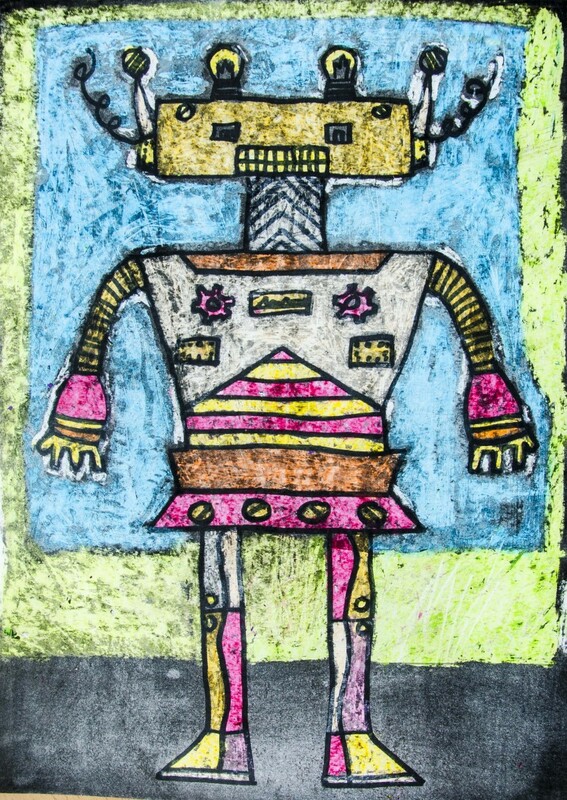 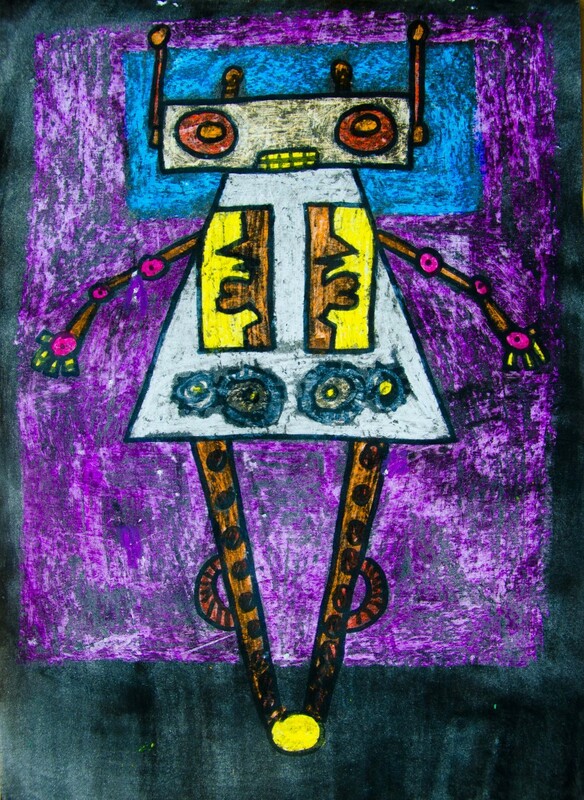 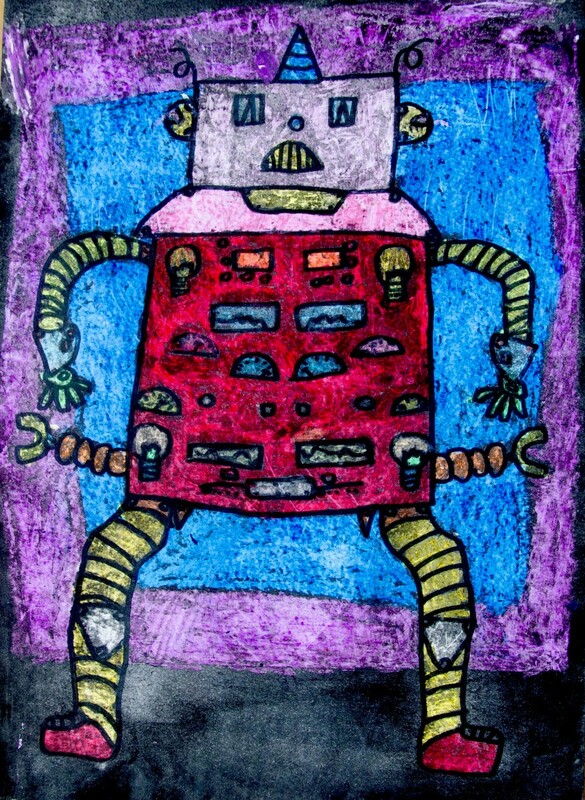 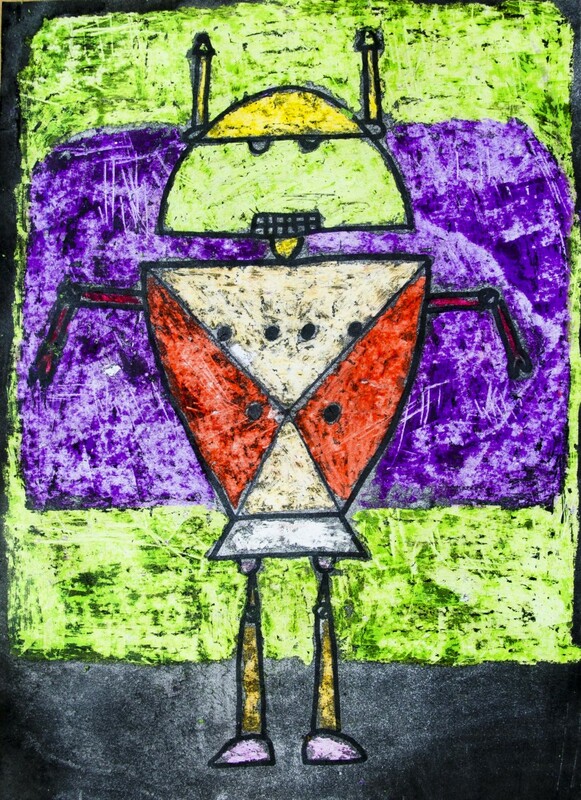 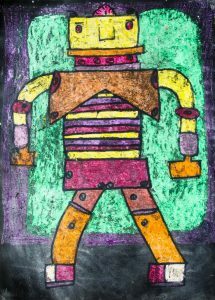 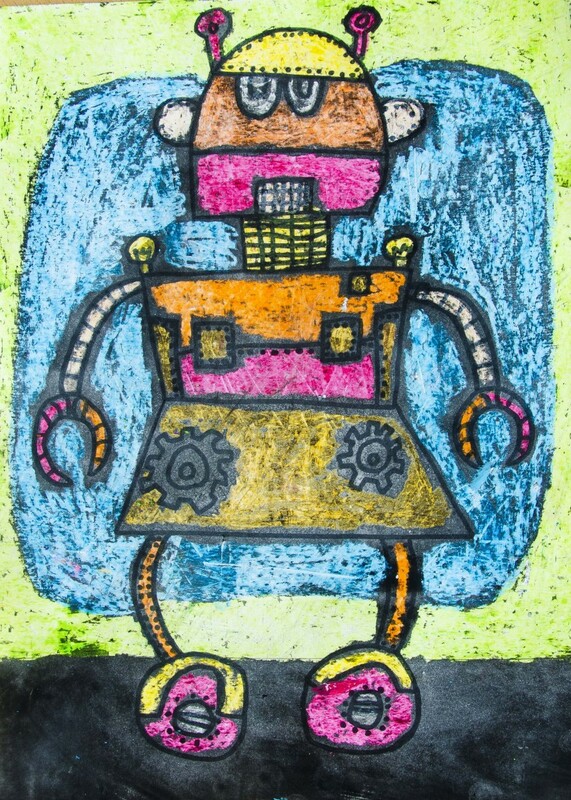 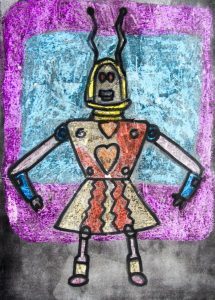 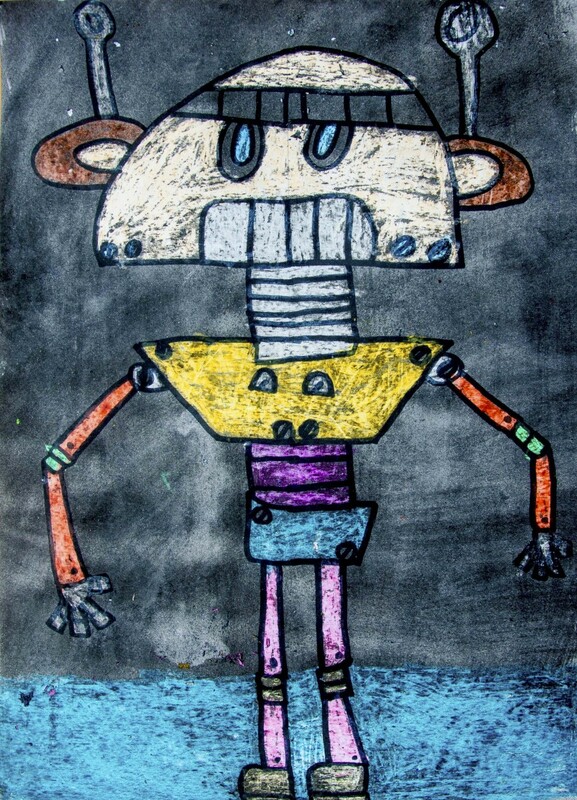 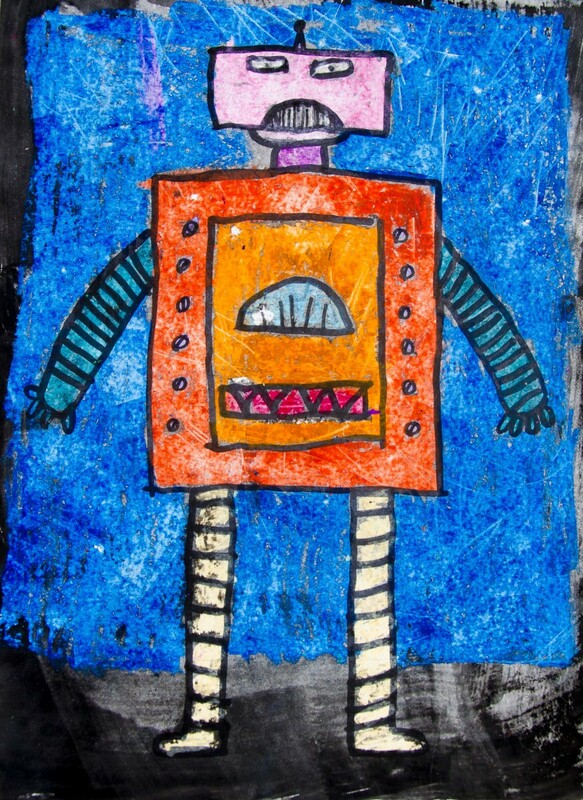 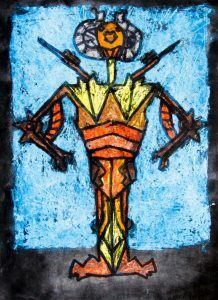 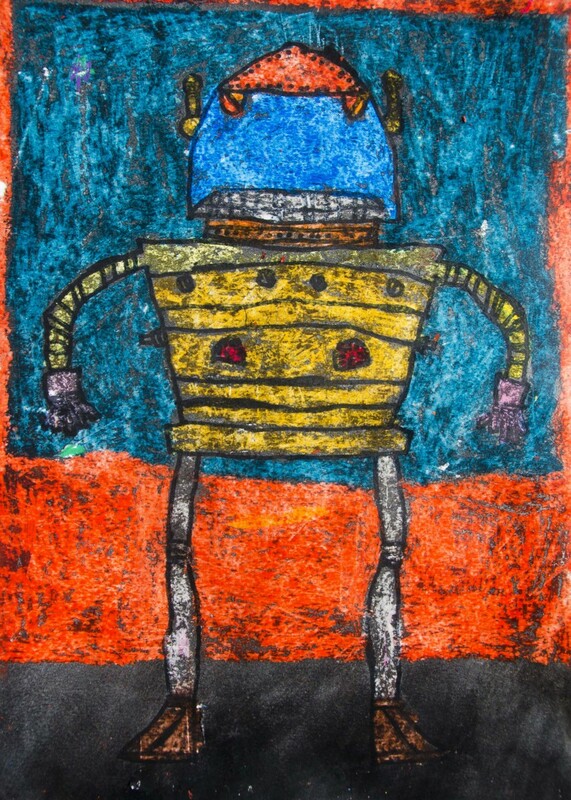 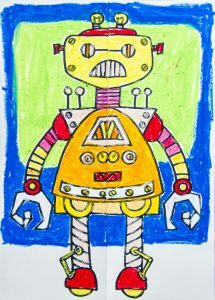 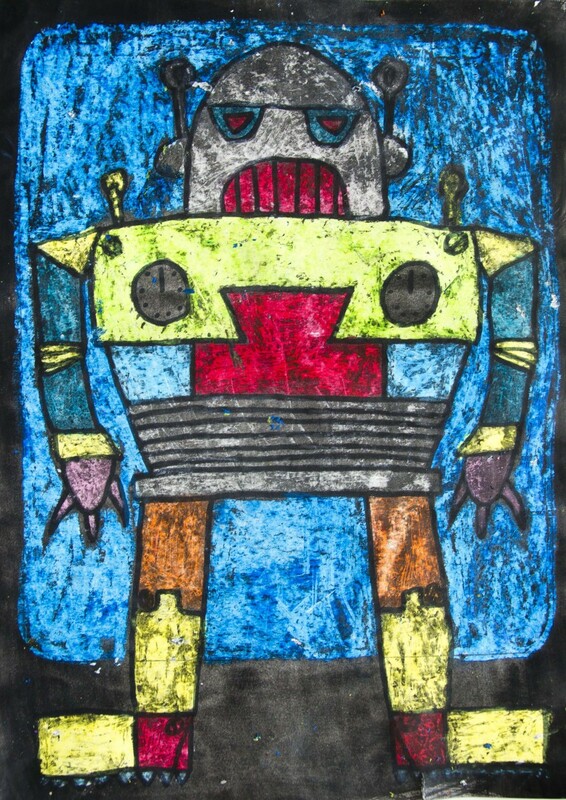 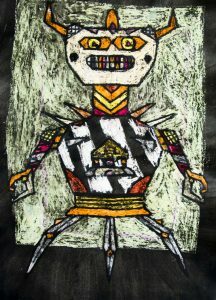 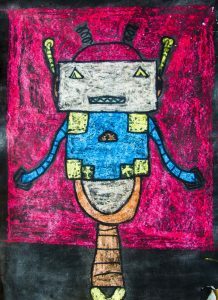 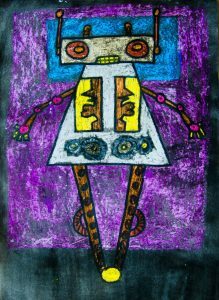 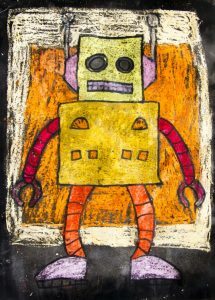 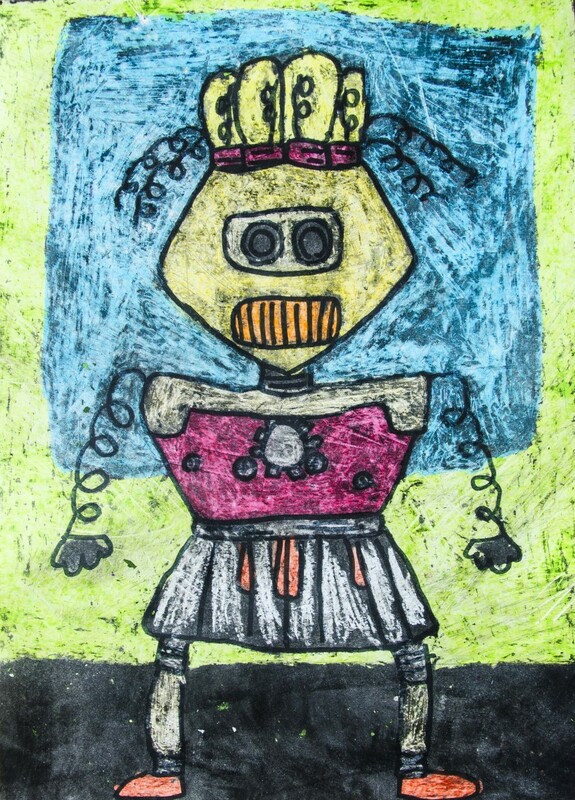 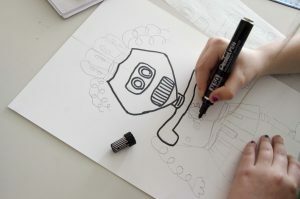 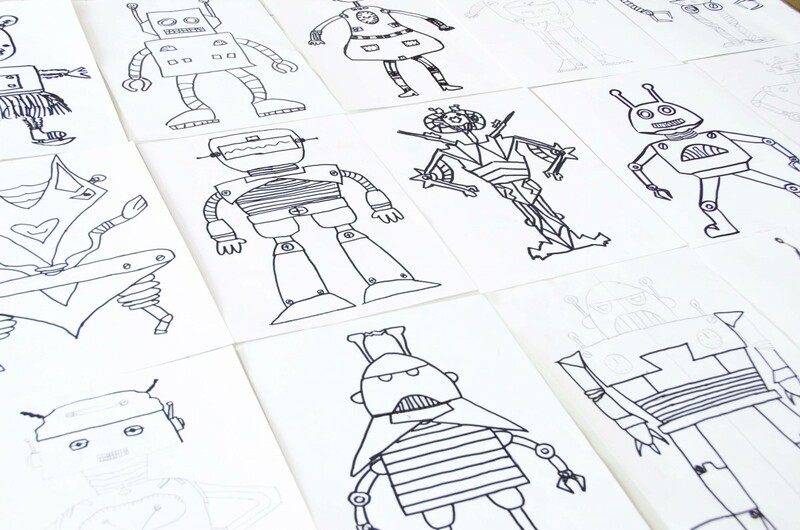 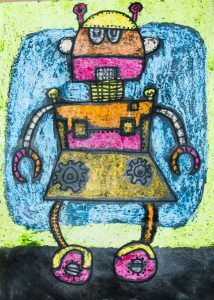 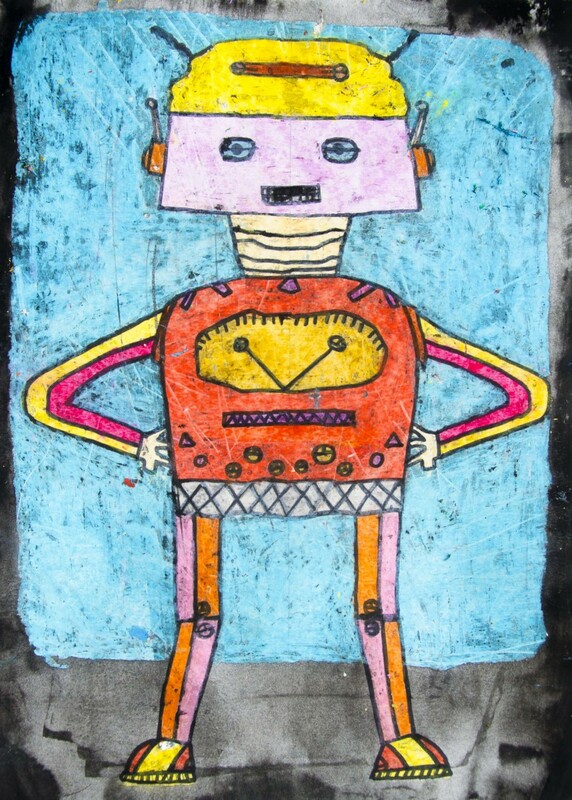 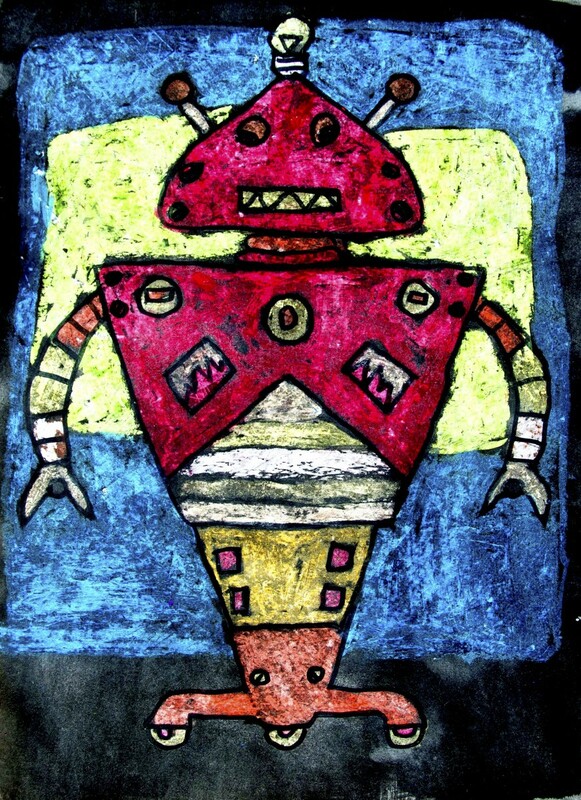 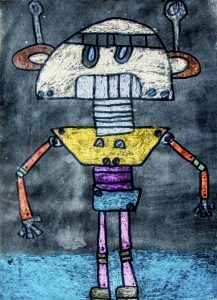 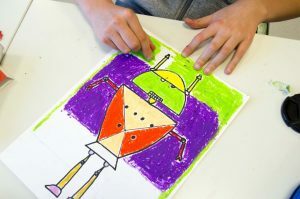 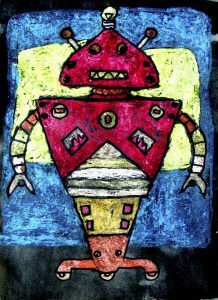 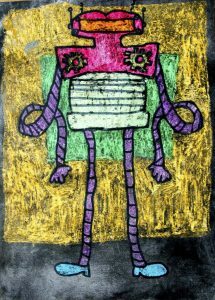 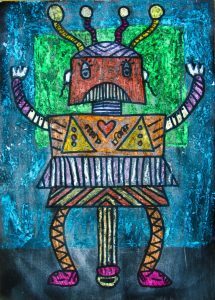 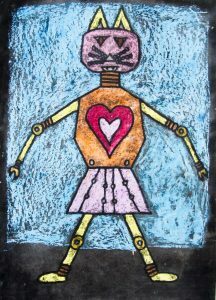 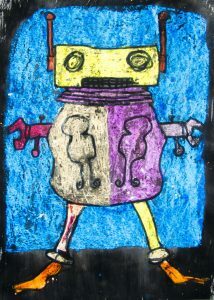 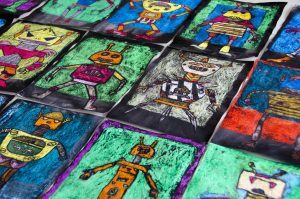 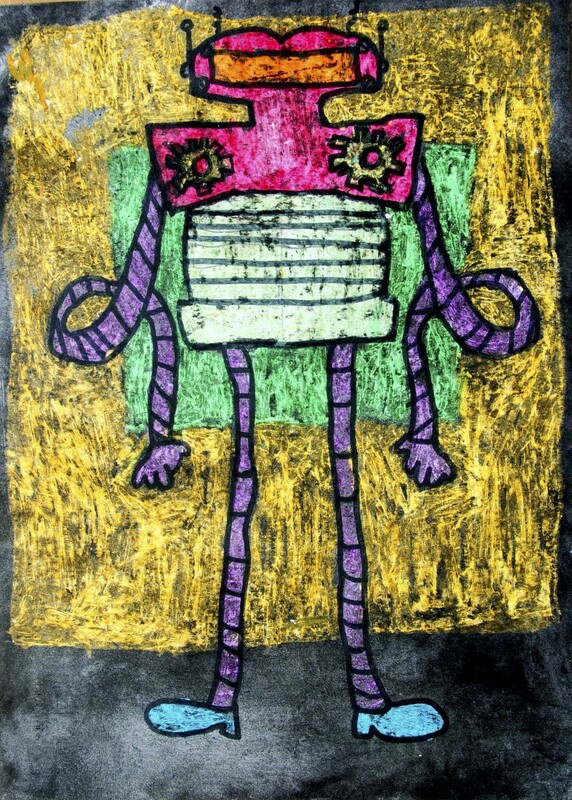 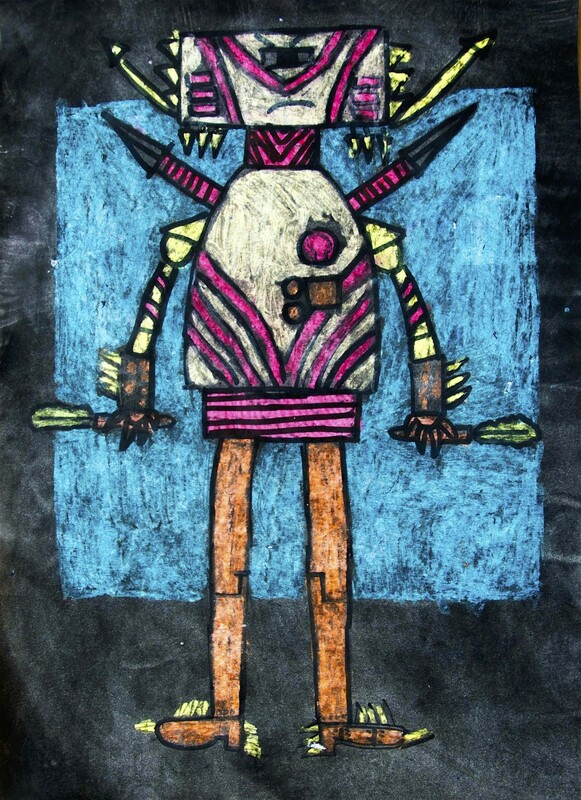 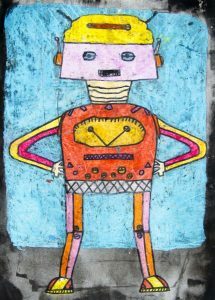 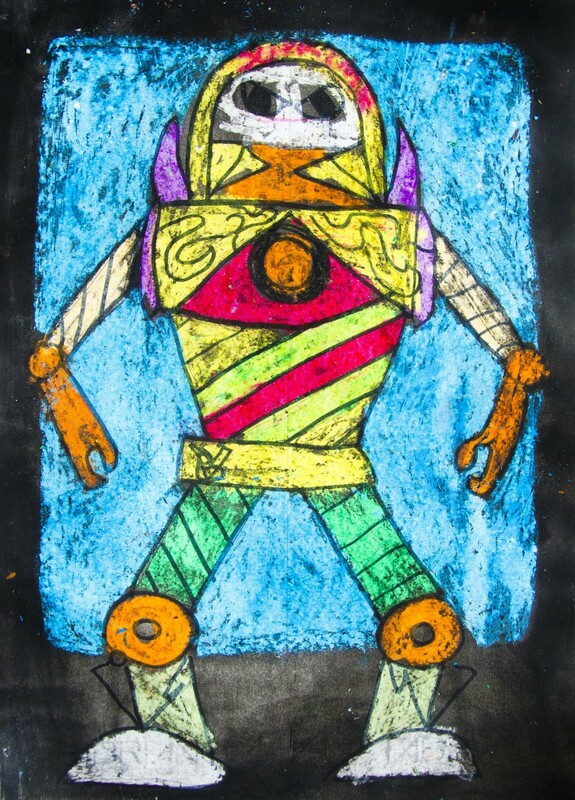 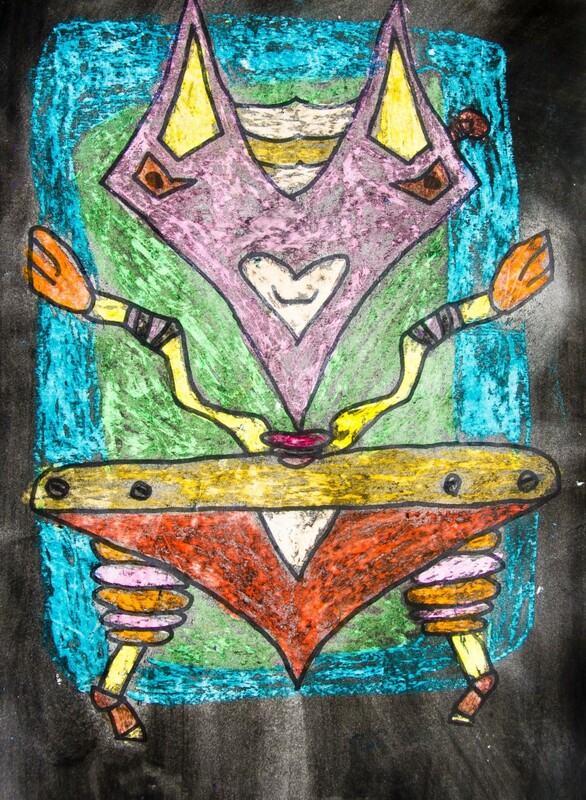 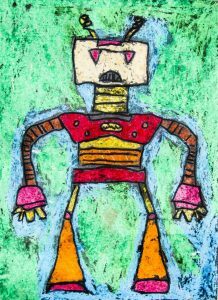 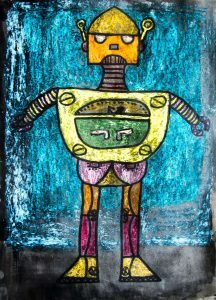 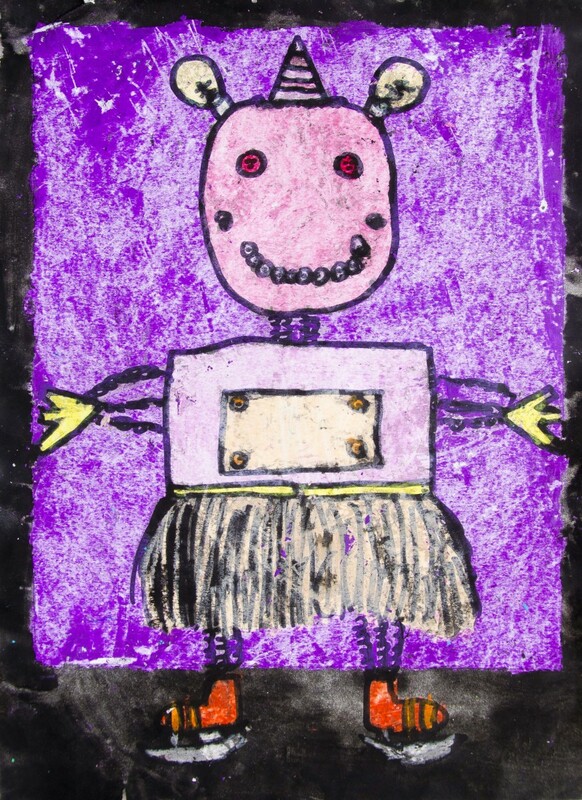 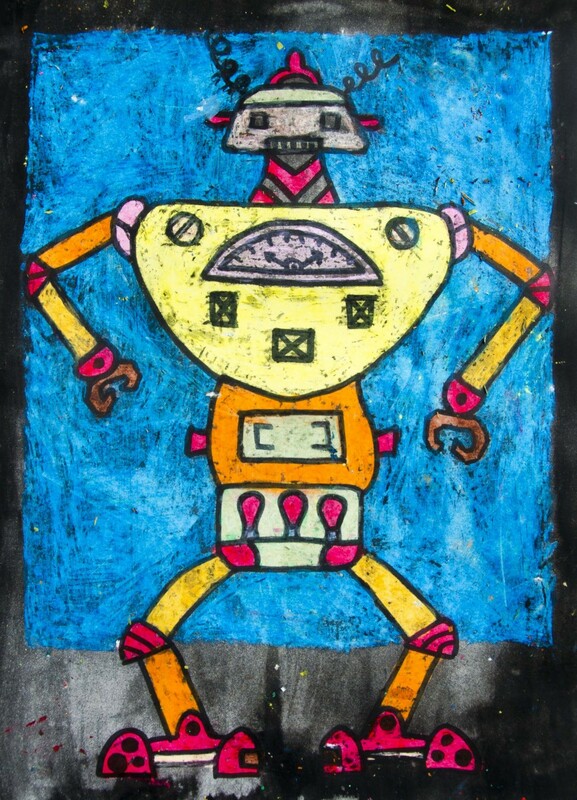 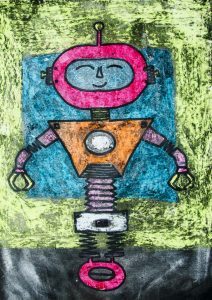 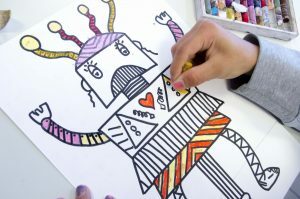 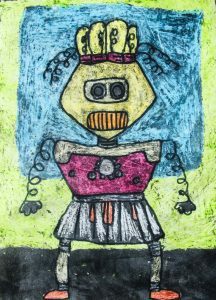 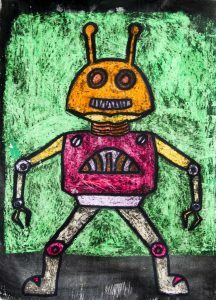 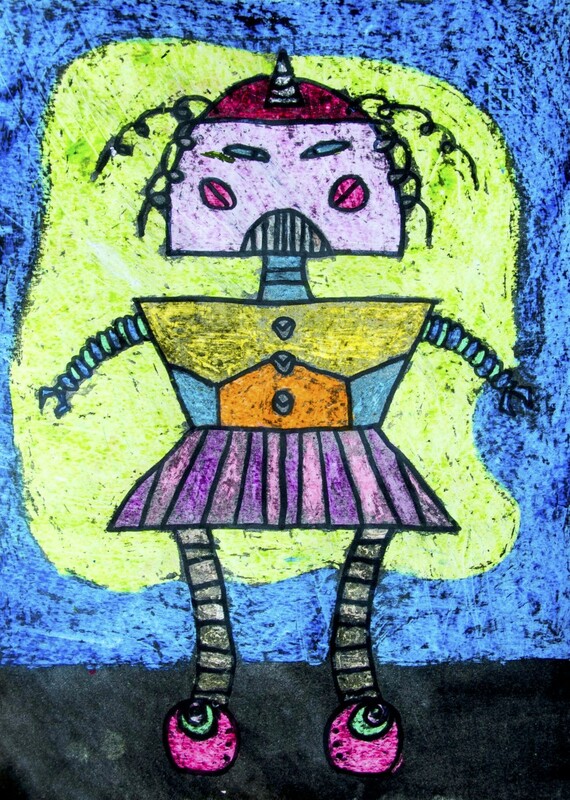 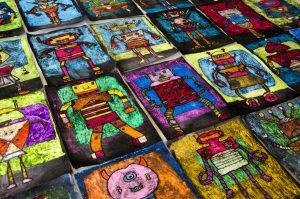 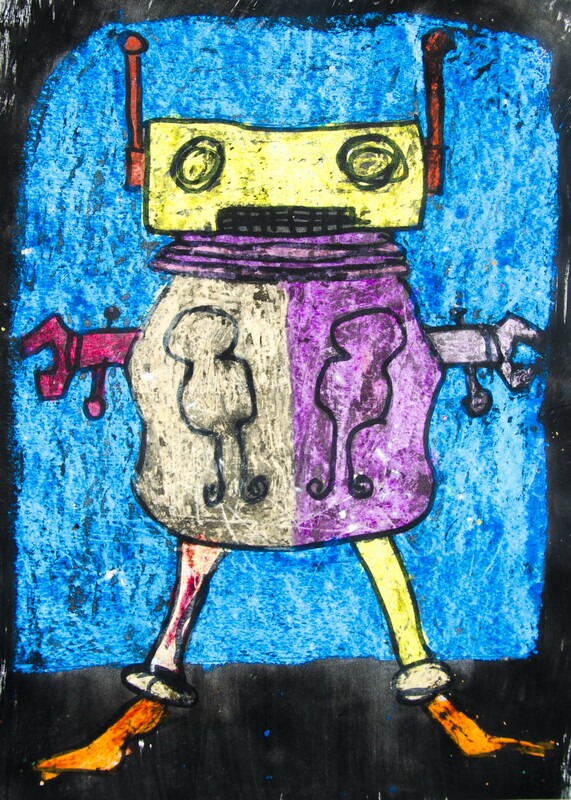 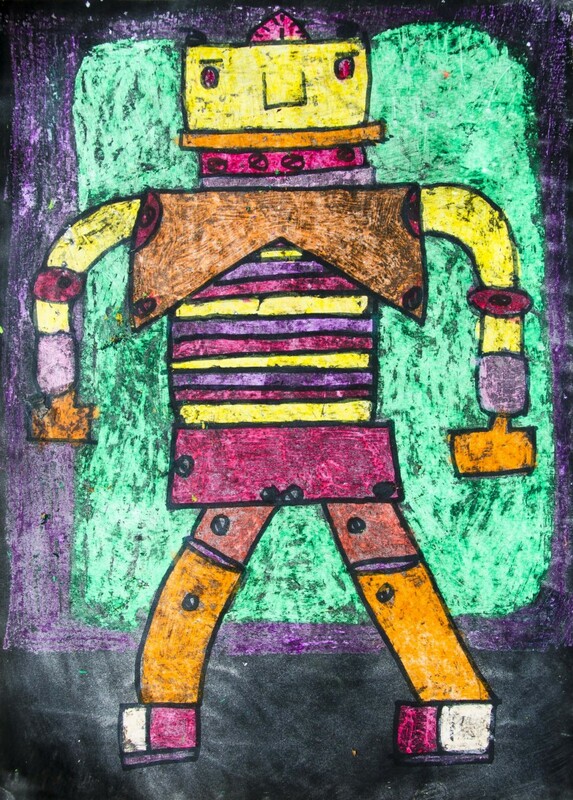 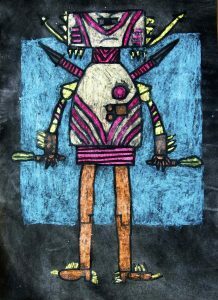 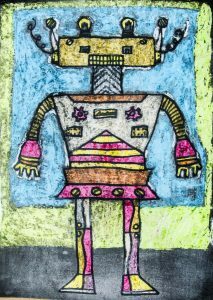 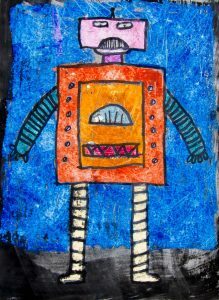 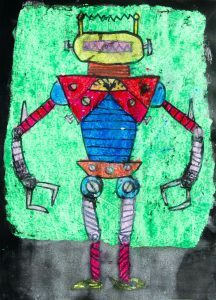 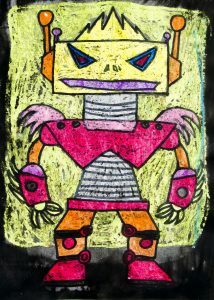 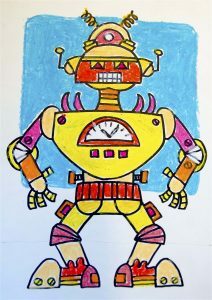 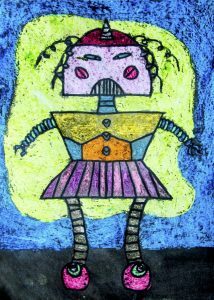 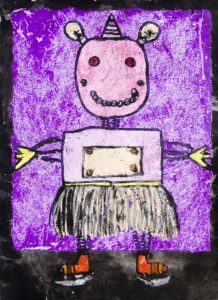 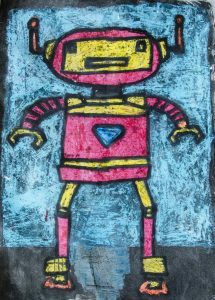 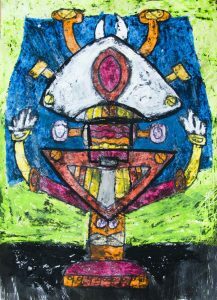 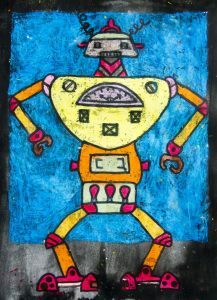 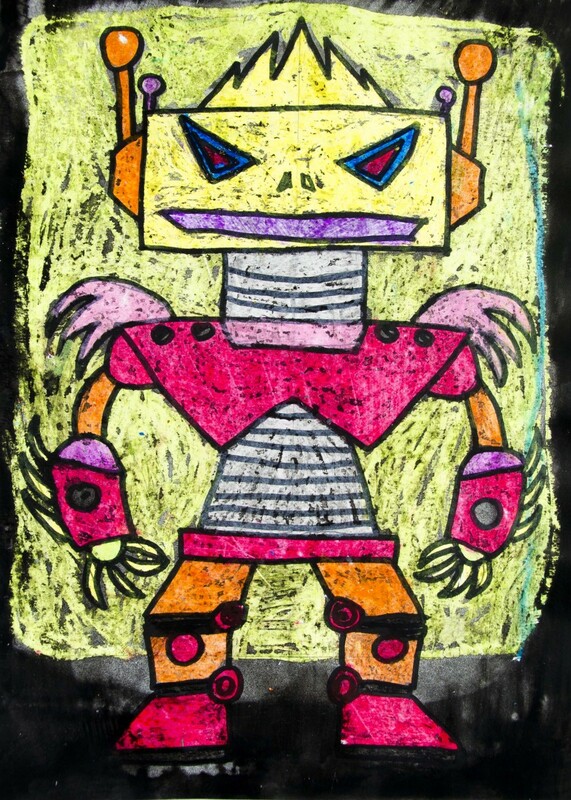 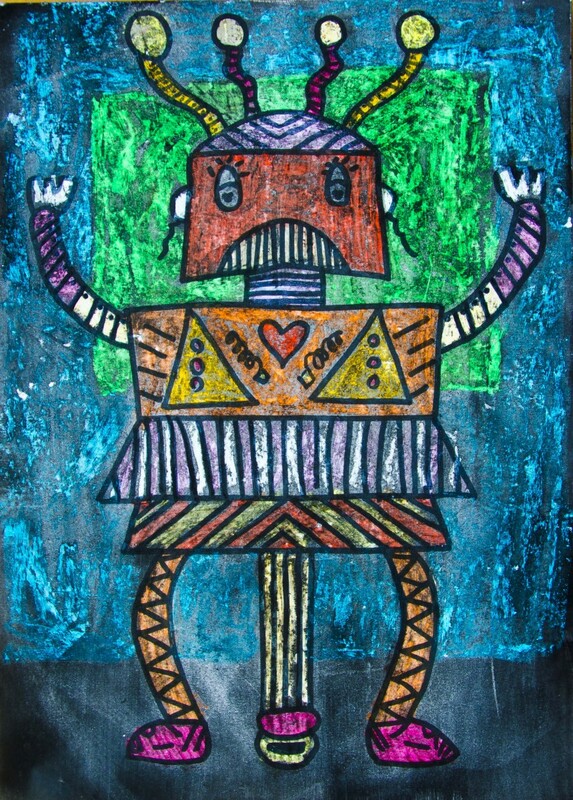 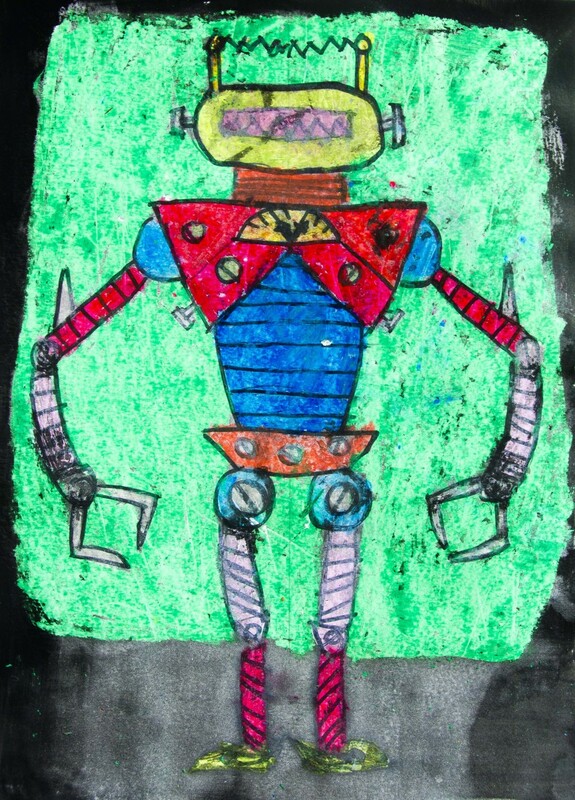 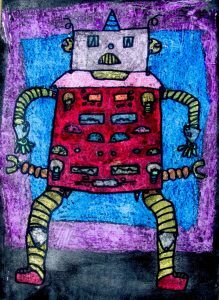 After the capitals and the insects we created the symmetrical robots, drawing the strangest and most immaginative robots. 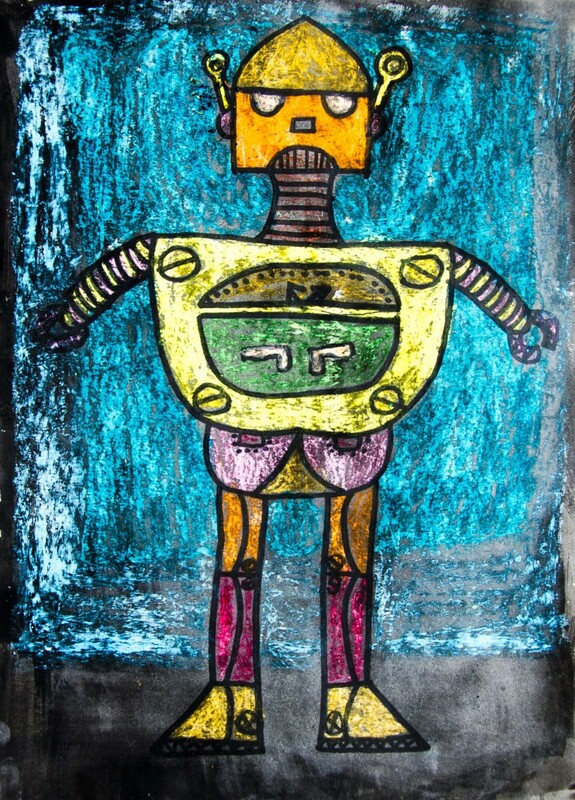 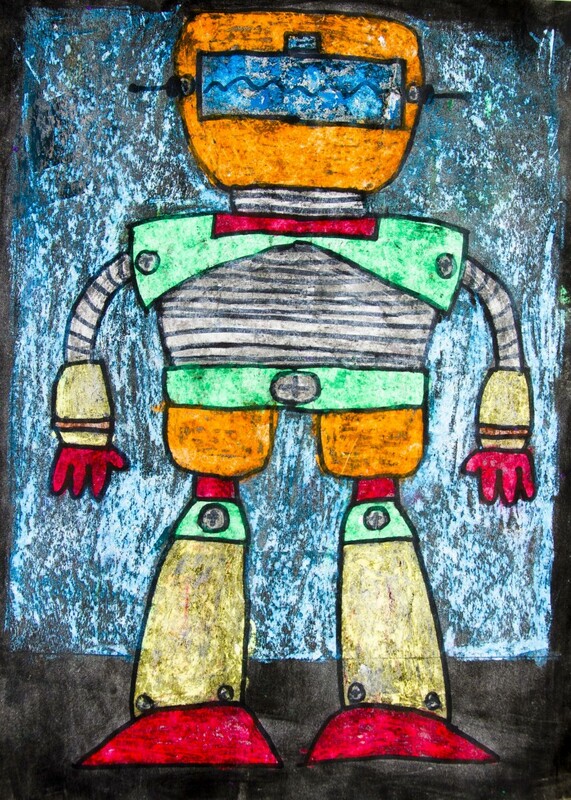 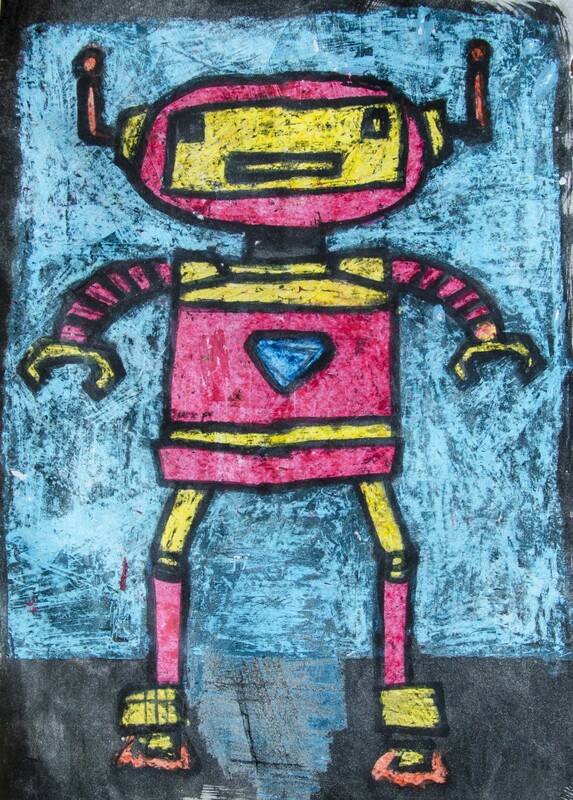 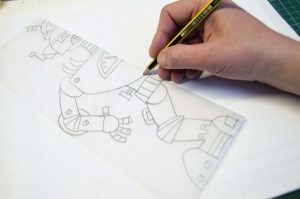 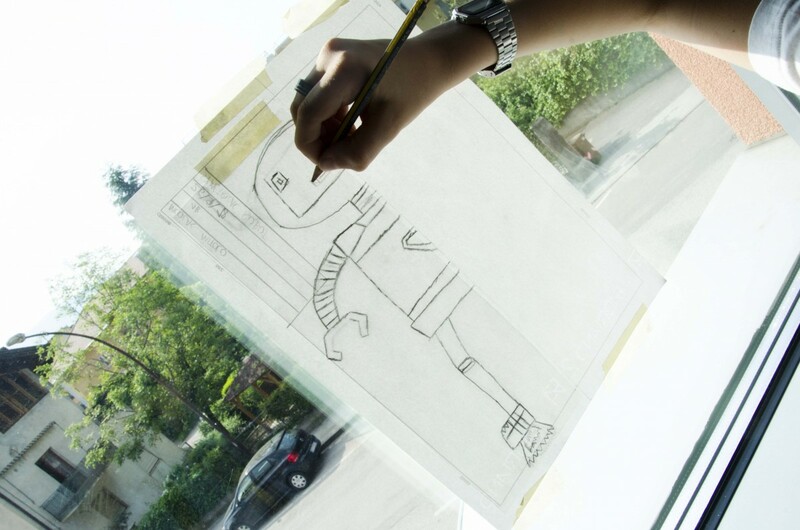 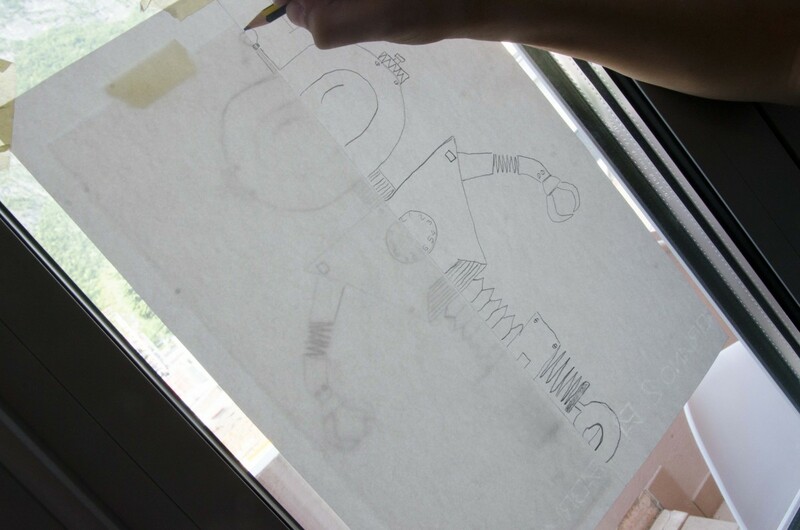 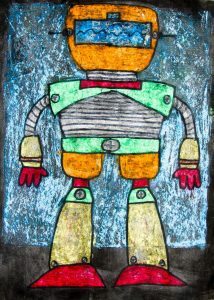 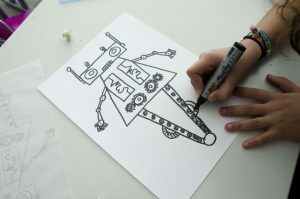 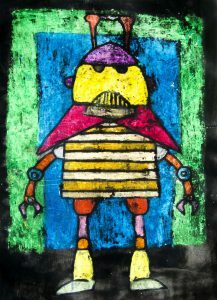 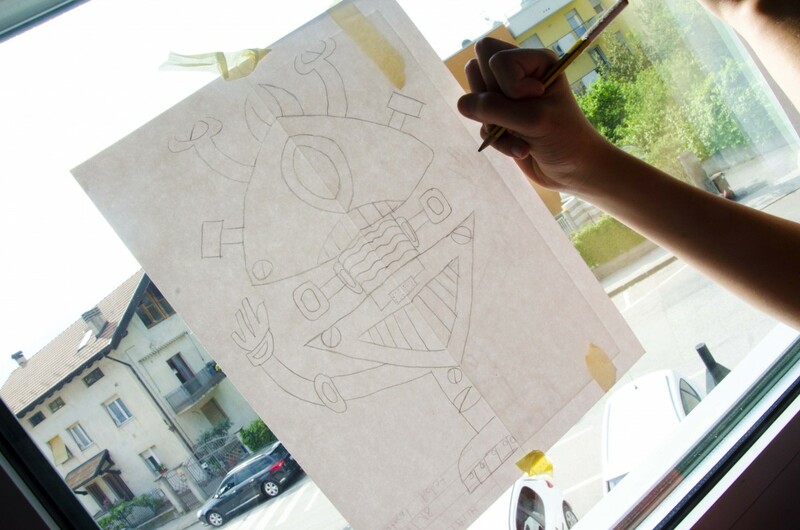 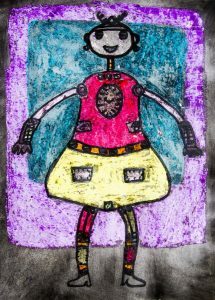 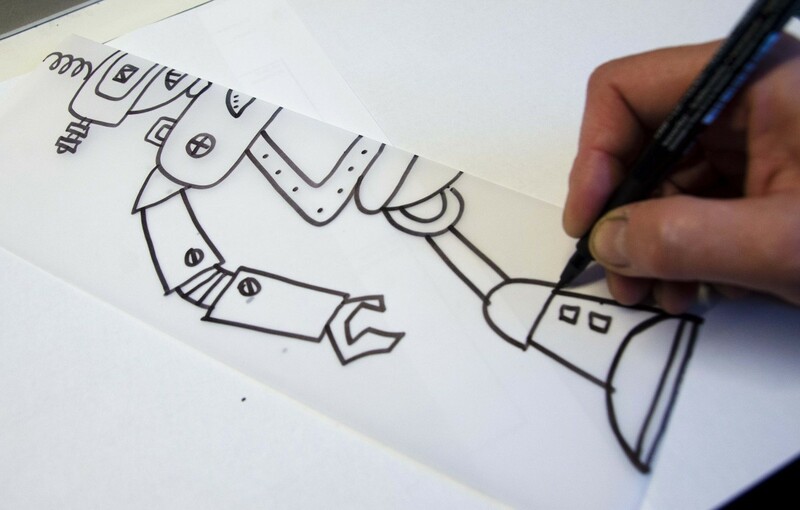 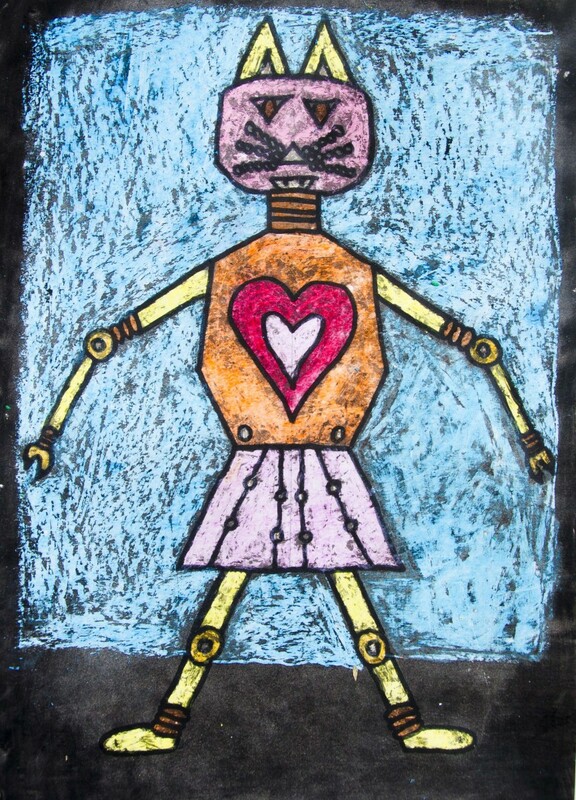 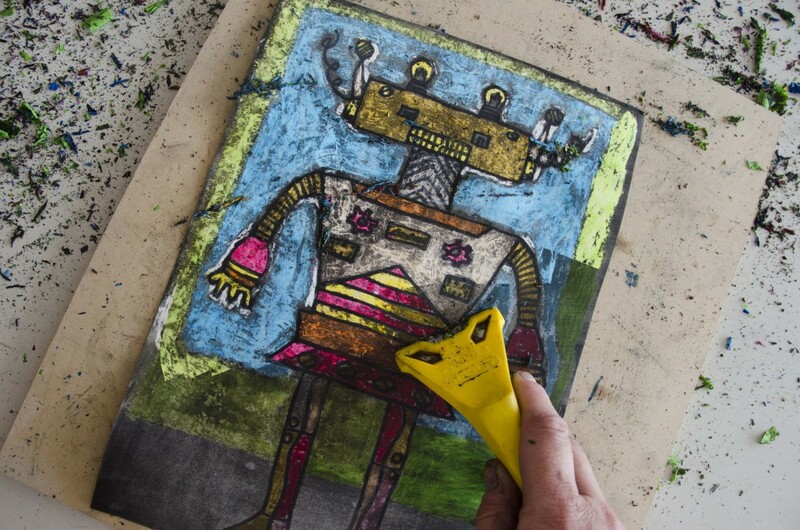 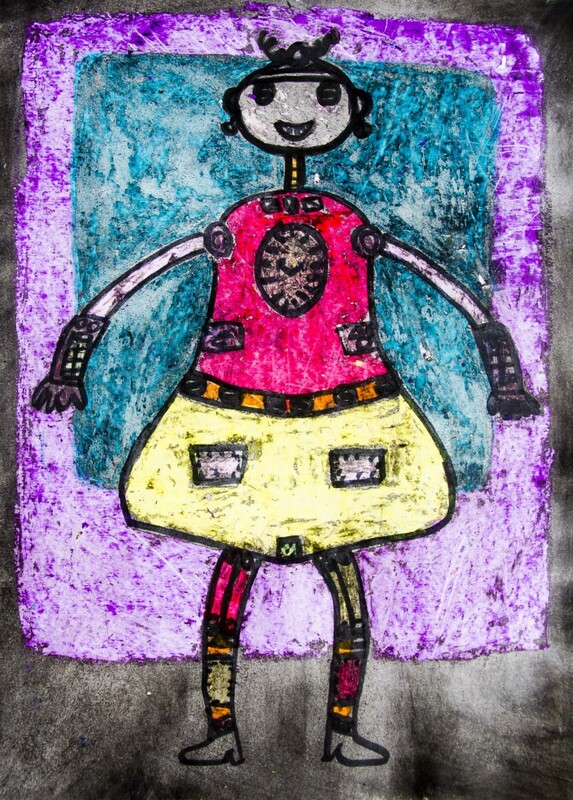 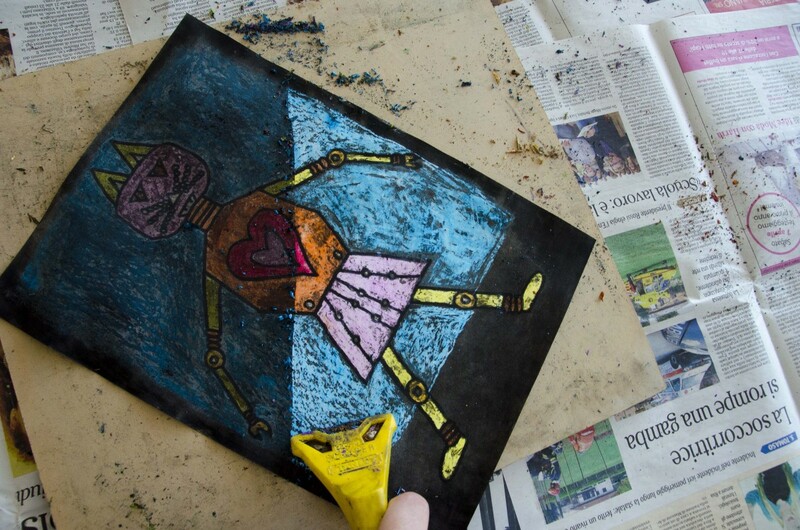 To realize this drawing we first drew half robot on half sheet of tracing paper. 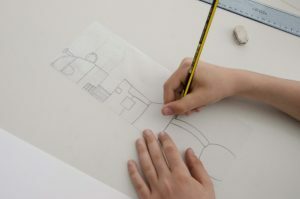 After that we copied it on a drawing sheet and copied it again turning it upside down, to complete a symmetrical figure. 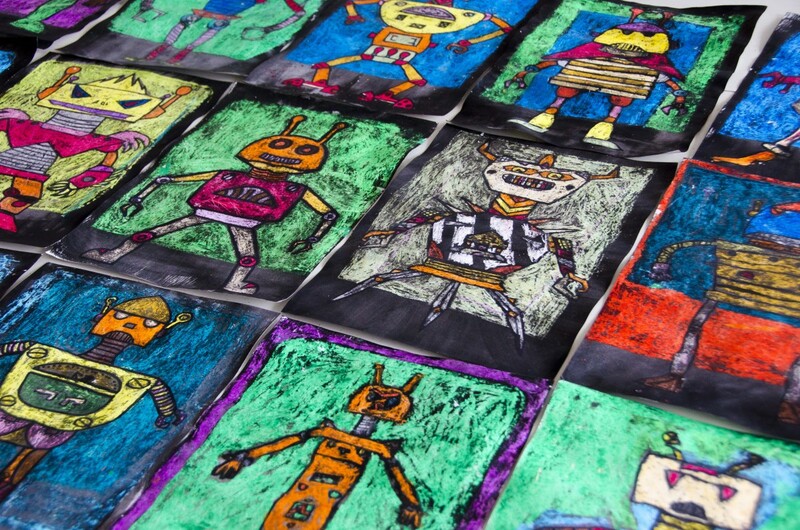 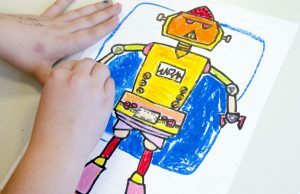 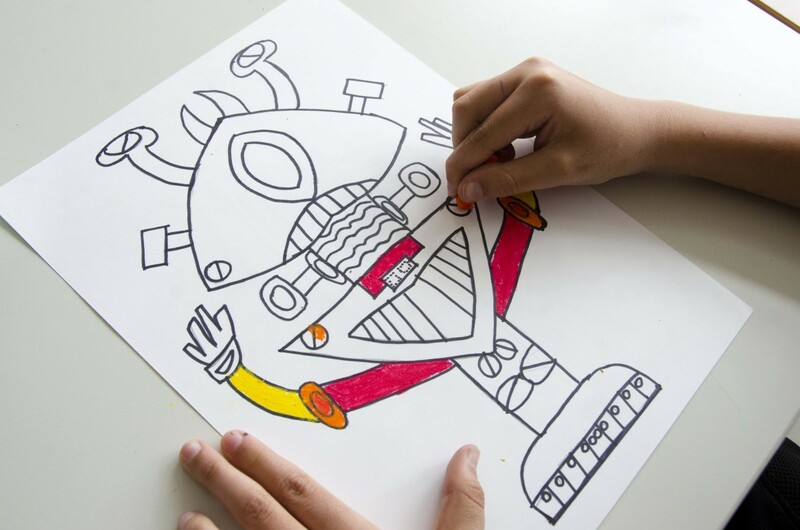 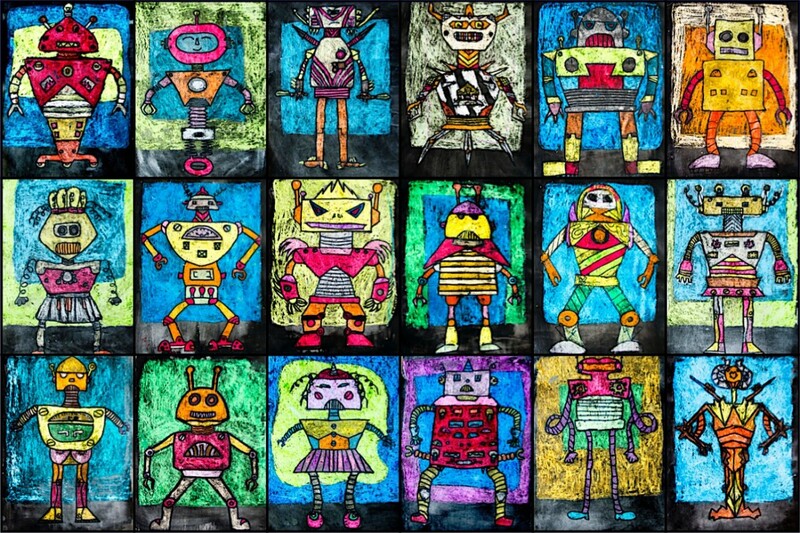 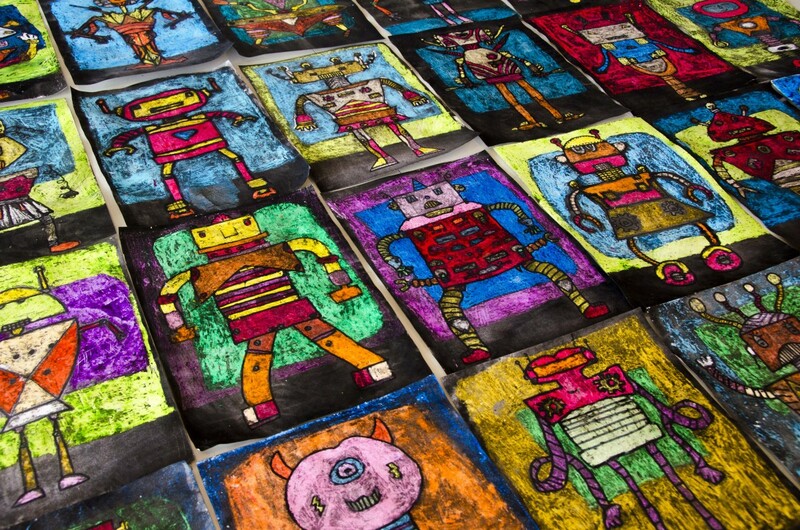 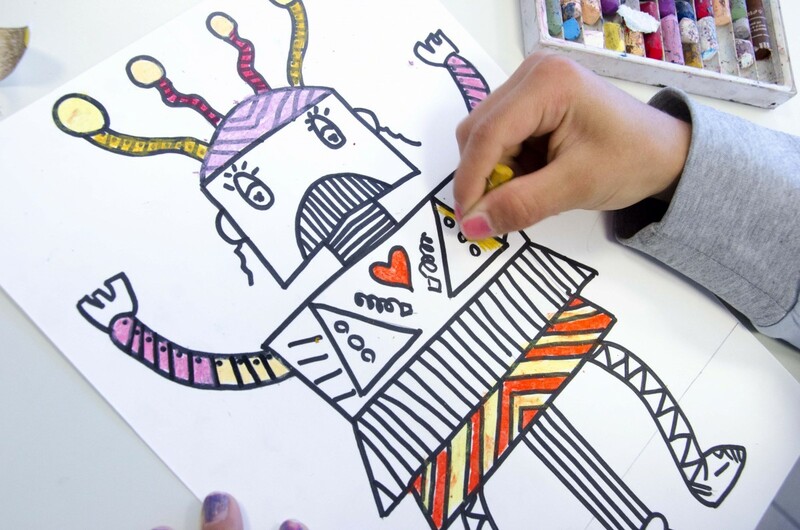 For our drawing we looked at some pictures on internet, but here below you can find three worksheets with different kinds of heads, torso, arms and legs to assemble in order to create the robot. 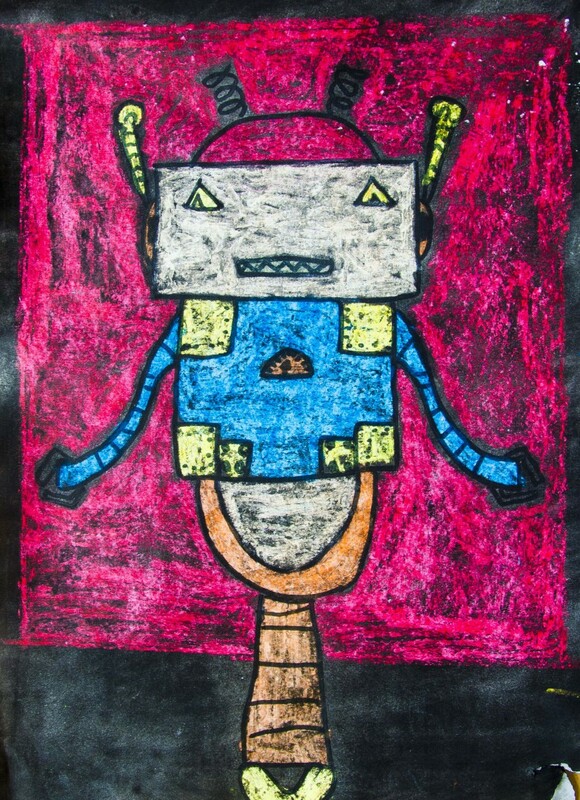 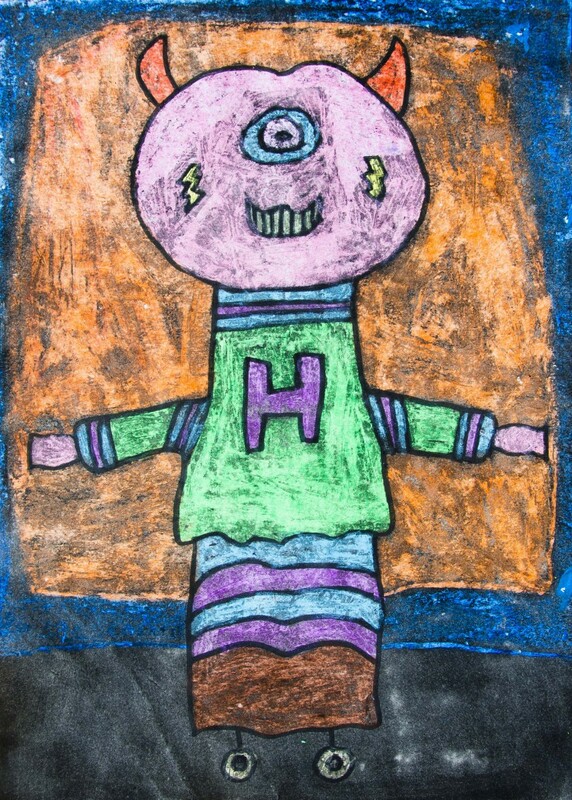 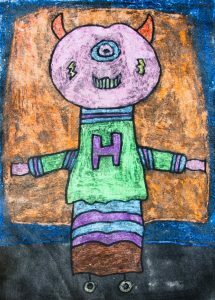 The drawing has been traced with a black permanent marker and colored with oil pastels, taking care to not coloring on the black lines. When the drawing was finished we covered it completely with black indian ink. 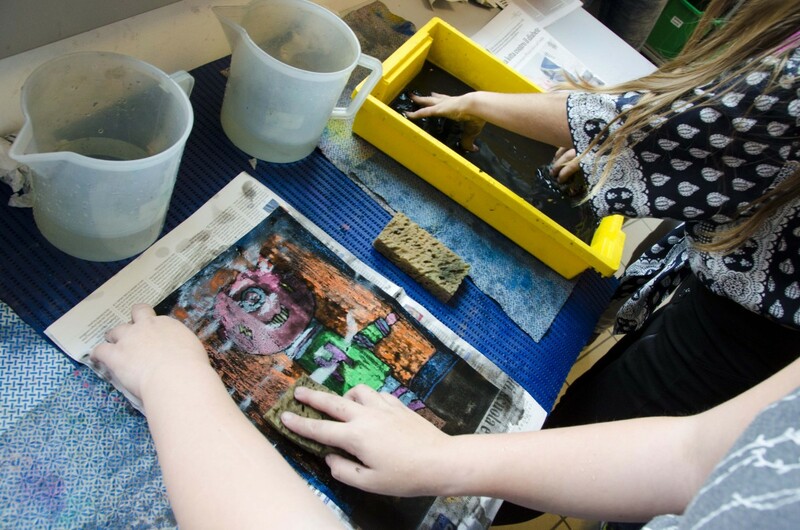 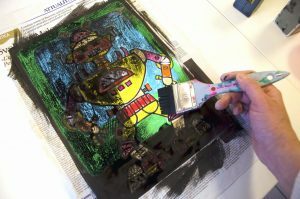 At the end we dipped the drawing in clean water and rubbed gently the drawing with a sponge, in order to remove the excess ink. If the drawing is too dark it is possible to scrape the surface with a scraper in order to partially remove the black layer. 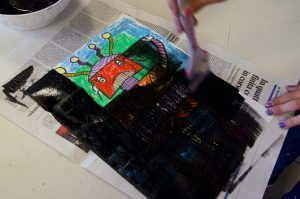 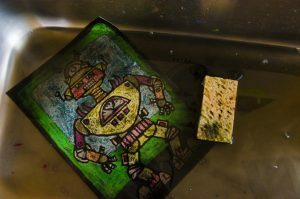 This technique is based on the oil physical/chemical property to create an ink-resist surface. 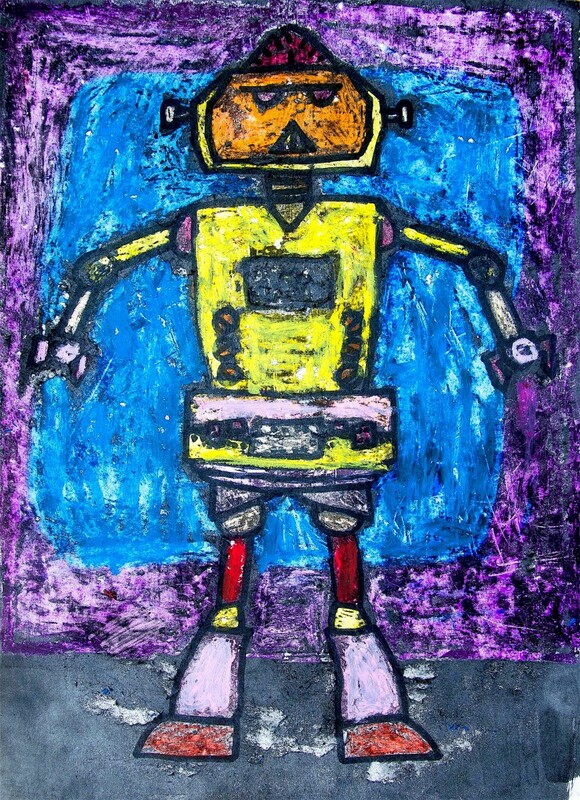 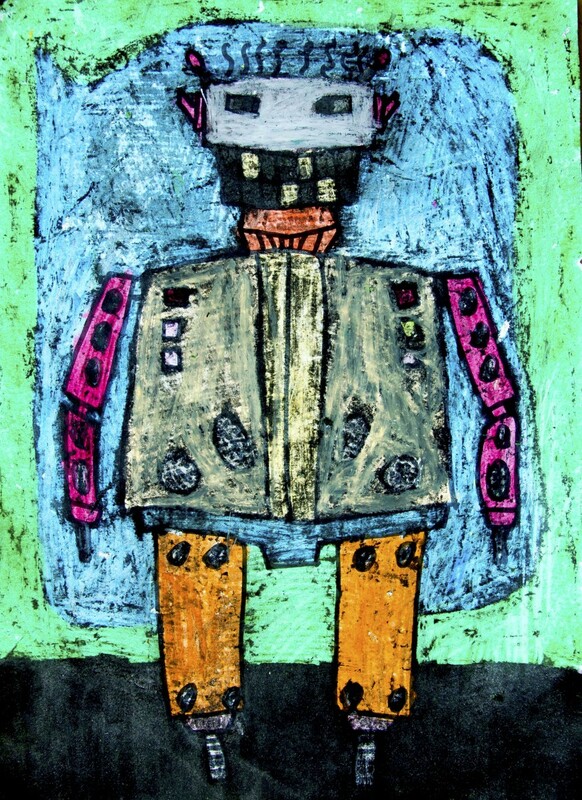 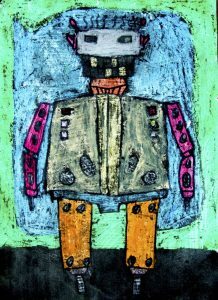 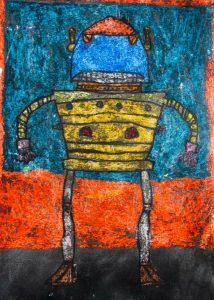 We created very interesting textures, that remind us rusty, scraped metal, giving the robots a “vintage” appearance.